Two female killer whales and their two calves were spotted as they hunted and ate a shark alive. The event was seen at the Monterrey Bay in California. Though scientists say it is normal for killer whales to eat sharks, they are rarely captured hunting or eating. 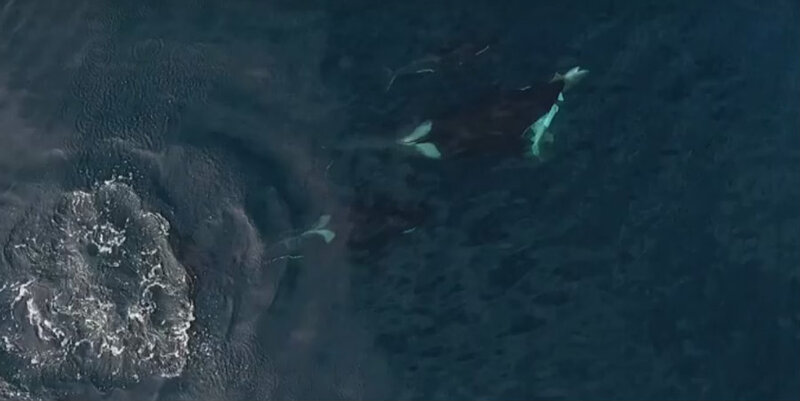 The killer whales were filmed by Slater Moore, who was the drone pilot. He said that the shark was alive as the four orcas were eating it. Apparently, it was a sevengill shark, which tends to be 10-feet long. However, according to Moore this shark was about five-feet long, though it was larger than the two calves. “And all of a sudden one of them brought it up, brought up the whole shark – and it was still alive, it was squirming around,” said Katlyn Taylor, a marine biologist and a member of the company Monterey Bay Whale Watch. The video captured by Moore shows two adult female killer whales and their two calves in the waters of the Monterrey Bay, California, as they ate a five-foot long sevengill shark. This has astonished the scientific community since these whales are rarely seen hunting on the water surface. These type of orcas are offshore whales use to nourish themselves with fish, sharks, squid and other mammals. However, they tend to hunt and eat underwater. Therefore, seeing them and capturing them as they eat a shark even larger than the calves on the surface of the Monterrey Bay was extremely rare. “They’re kind of tricky animals to study,” said Katlyn Taylorshe according to a The Verge report. “They hold their breath a long time, they swim really fast, they travel way offshore. That’s part of the fun, though, you never know what’s going to happen,” she said. Taylor also said that though this is unusual to see on the surface, scientists are not surprised to see these whales eating a shark. Sometimes, dead whales are washed ashore with shark bites on their skeleton. As well, the teeth of the whales might get damaged because the skin of the shark is difficult to chew. Different species of killer whales? Taylor also said that this type of whales is the most commonly seen in the Monterrey Bay that is the transient killer whales. On the other hand, the ‘offshore killer whales’ are seen in the Monterrey Bay only once a year. Killer whales are found in different parts of the globe especially in cold waters including the Antarctica, the North Atlantic, and Pacific Oceans. They are, at the moment, considered to be monotypic, meaning that they belong to one species. However, genetic studies and morphological evidence might lead the scientific community to consider the existence of different subspecies of killer whales. Scientists say that there are some differences between transient and offshore killer whales. They don’t interbreed, and they don’t hunt the same preys. Transient type whales are often found in long-term stable social units of less than ten whales, and they usually feed on other mammals. They are one of the most studied groups of killer whales. Offshore whales, on the other hand, are probably the less studied group of killer whales. Since they usually protect themselves in deep waters. This group tends to gathers together in groups of 20-75 animals.